Annie was a Jewish immigrant and working mother of three living in a Boston tenement with her husband, a peddler. This was as close to the American dream as she was likely to get-until she became part of what one newspaper called 'one of the most novel wagers ever made': a high-stakes bet between two wealthy merchants that a woman could not ride around the world on a bicycle, as Thomas Stevens had a few years before. Annie rose to the challenge, pledging to finish her fifteen-month trip with a staggering $5,000 earned by selling advertising space on her bike and her clothing, making personal appearances in stores and at bicycle races, and lecturing about her adventures along the way. When the Londonderry Lithia Springs Water Company of New Hampshire offered to become the first of her many sponsors, Annie Kopchovsky became Annie Londonderry, and a legend was born. So began one of the greatest escapades-and publicity stunts-of the Victorian Age. In this marvelously written book, author Peter Zheutlin vividly recounts the story of the audacious woman who turned every Victorian notion of female propriety on its ear. When Annie left Boston in June 1894, she was a brash young lady with a 42-pound bicycle, a revolver, a change of underwear, and a dream of freedom. The epic journey that followed-from a frigid ride through France to an encounter with outlaw John Wesley Hardin in El Paso-took the connection between athletics and commercialism to dizzying new heights and turned Annie into a symbol of sexual equality. 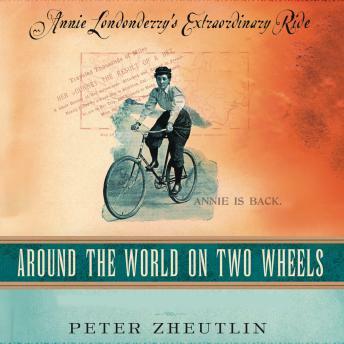 A beguiling true story of a bold spirit who reinvented herself against all odds, Around the World on Two Wheels blends social history and high adventure into an unforgettable portrait of courage, imagination, and tenacity.